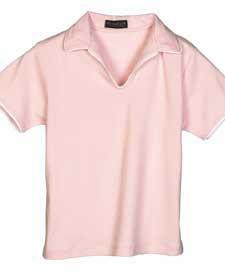 Fine rib cotton interlock with 3.5% spandex, 7 oz., double-needle stitching, matching knit collar and cuffs, V-shaped placket with a single matching signature button, printed twill taping inside neck, side seams, shorter body length. 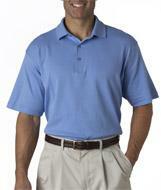 100% ring-spun combed Egyptian cotton, 5.75-oz., High-luster finish, Extra-long-staple cotton for superior strength. 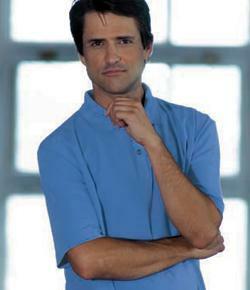 Tailored fit, Side-seamed, Feminine V-neck, Double-needle hem. 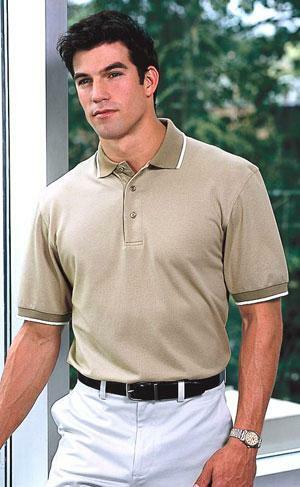 60% Cotton/40% Polyester, RS Interlock, 2-Button Clean Finished Placket, Birdseye Stripe Fashion Collar and Welt Cuffs, and Hemmed Bottom with Side Vents. Woodtone Buttons. 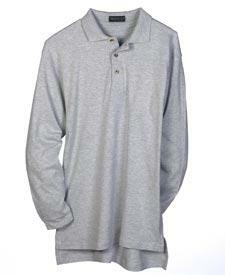 87% ring-spun cotton 13% polyester interlock, 6.5 oz., knit has subtle two-tone pattern with reverse pattern on collar and cuff, three-button placket, signature woodtone buttons, printed logo on dyed to match twill taping on neck and side vents, side seams, double-needle stitching, half moon on back. 100% ring-spun combed Egyptian cotton, 5.75-oz., Wider, longer Relaxed Fit for optimum comfort, Extra-long-staple cotton for superior strength, Split drop tail, Double-needle hem. Matches with Ladies' style #8506. 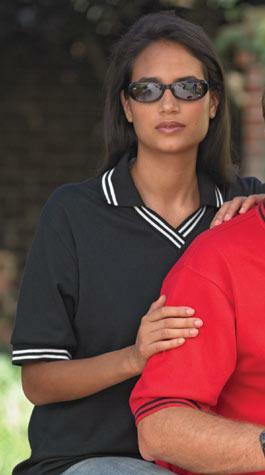 100% Cotton Interlock, Double Track Stripe V-Neck Johnny Collar and Welt Cuffs, Single Needle Safety Stitched Shoulder Seam and Armholes, Double Needle Hemmed Bottom. 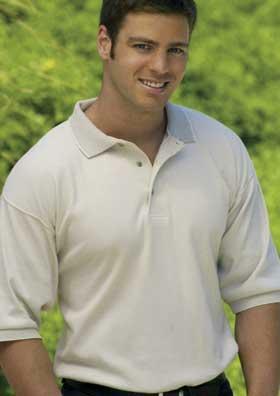 100% ring-spun combed Egyptian cotton, 5.75-oz., Wider, longer Relaxed Fit for optimum comfort, High-luster finish, Extra-long-staple cotton for superior strength, Side-seamed, Contrast-tipped collar and cuffs, Split drop tail, Double-needle hem. Matches with Ladies' style #8504. 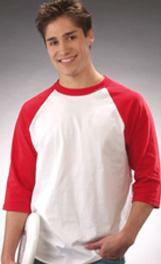 100% ring-spun combed Egyptian cotton, 5.75-oz., High-luster finish, Extra-long-staple cotton for superior strength, Side-seamed, Contrast piping on collar and sleeves, Double-needle hem. 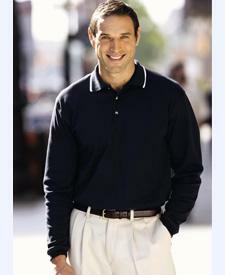 Matches with Men's style #8503. 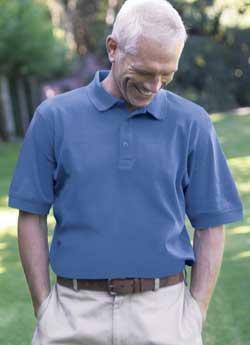 100% ring-spun combed Egyptian cotton, 5.75-oz., Wider, longer Relaxed Fit for optimum comfort, High-luster finish, Fine-gauge-knit fabric for amazing smoothness and softness, Side-seamed, Ribbed collar and comfort cuffs, Split drop tail, Double-needle hem. Matches with Ladies' style #8502. 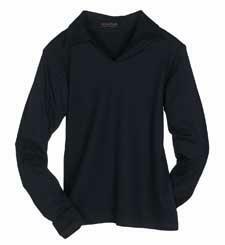 100% ring-spun combed Egyptian cotton, 5.75-oz., High-luster finish, Fine-gauge-knit fabric for amazing smoothness and softness, Side-seamed, Feminine V-neck styling, Double-needle hem. 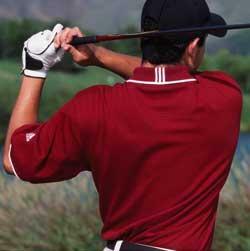 Matches with Men's style #8501. 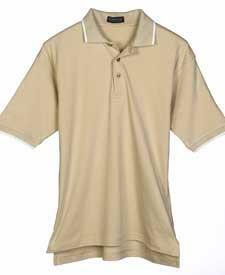 4.7-ounce, 60/40 cotton/poly; welt collar and cuffs, locker patch, side vents, double-needle stitching; plastic buttons. 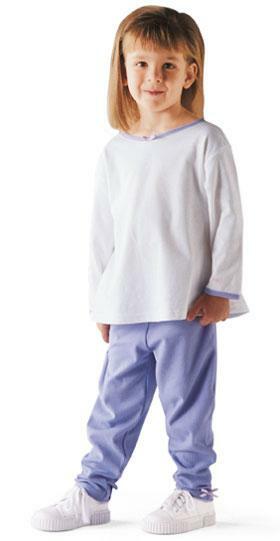 100% ring-spun combed Egyptian cotton, 7.25-oz., Wider, longer Relaxed Fit for optimum comfort, Fine-gauge-knit fabric for amazing smoothness and softness, Side-seamed, Dyed-to-match flat-knit ribbed collar and cuffs, Split drop tail, Double-needle hem. 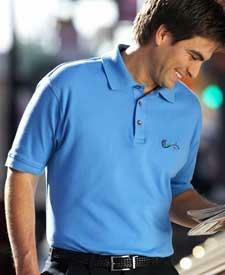 55% cotton/45% Coolmax � polyester 4.5 ounce interlock knit polo. 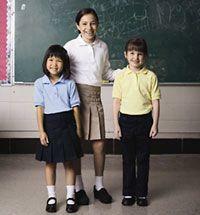 Coolmax � fabric for cool comfort. Four cream buttons on a clean-finished placket. Double-needle stitched side-seams. 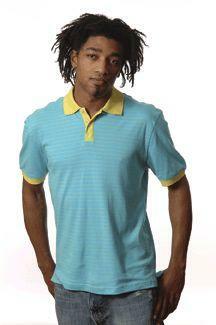 Men's Clima Lite Interlock Short Sleeve Polo. 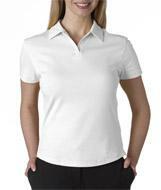 Ladies' Clima Lite Interlock Short Sleeve Polo.